My Cardboard Life » 2013 Stories: Vote for your favourites! Here’s a list of the tiles with links to the larger sized pictures: I’ve added the number of votes each story got. Vote by commenting on this blog post. You’re allowed to choose more than one if you can’t decide. I’ll count up the votes after ten days, and start writing the winning story right away. I’m happy for any one of these to win so vote from the heart. Which one do you want to read? It’s up to you! Voting is closed now. We’re Out wins with 32% of the votes! Thanks for voting for the craziest one. I reckon I’m going to have a lot of fun putting it together! I’ll start writing it right away and later in the year it will become a real story which you can read. Thank you so much for taking part. Hopefully I’ll be able to make some of the other stories at some point as well so if your favourite didn’t win you might still get to see it. Puppy School or We’re Out. I’d love to see what adventures Colin and Pauline would get into! We’re Out! We’re Out! We’re Out! We’re out looks really great too though! BUSINESS PAULINE! or We’re Out. But really, Business Pauline! The Dimension of the Ghosts! I love “spooky” tales. We’re Out looks looks like a very exciting read!! My second vote goes to Paper Patisserie. We’re Out and Puppy School!! in order of my preference which I know you want to hear: We’re Out, Weird Undersea & Robo BFF. Darn it, I like them all, but that’s not very helpful. Can’t you clone yourself? Soooo… We’re Out, Business Pauline, Treasure in the Arctic, and Tantrum. “We’re Out” obviously! and I would also like to see “Paper Patisserie” someday. And then Dimension of Ghosts/Treasure in The Arctic. We’re Out, Puppy School, or Robo BFF. I can’t decide between Treasure in the Arctic, or Town Flyer. I vote for Business Pauline and We’re Out! That’s a tough one! All of them look great! I think “Paper Patisserie” looks especially delightful though! And my second vote goes to “The Dimension of the Ghosts” for a good spook! I love your stories and I’ll be happy to read any one of the above, though I have a feeling that it’s going to be “We’re out”, judging from all the comments above Have a wonderful weekend. They all look great… this is hard! But I’m gonna ask for RoboBFF and Paper Patisserie! We’re out is a must-read, I’d say. Followed by Business Pauline and the Fortune Fax Machine. We’re Out and Paper Patissiere. You have simply GOT TO do We’re Out! I’ve always loved the jokes that use the fact that they’re made of material. Got to be We’re Out! Paper Patisserie, all the way! Were out looks so cool. Or paper patisserie because cake amiright? I’ve always wanted to see more about Sebastian! Puppy School! Treasure in the Arctic, and We’re Out are my top two. Also Weird undersea, and town flyer because I can’t choose just two. My vote goes to Weird Undersea because of all the beautiful sea creatures. We’re Out looks like it would be a great project though. We’re Out! Insane adventures in the so-called “real world!” Maddening three-dimensional scene setups! SUPER AWESOME. Oh my goodness gosh. Couldn’t you have made some deliberately rubbish to make this easier? Well… I love Sebastian, so Puppy School… And Dimension of Ghosts looks cool… But I love the idea of We’re Out… Damn it! We’re Out would be awesome! Then Treasure in the Arctic and Paper Patisserie. I vote Treasure in the Arctic or We’re Out! Definitely gotta go with “We’re Out”. It’s difficult to pick a second favorite though … I guess I’d go with “Tantrum”. They all look great, though. Can’t wait to see which one wins! Treasure in the Attic. uh, Artic. Yes the one without dust, that should be Artic. My first choice is Paper Patisserie, second would be Dimension of Ghosts. First choice:Tantrum. Followed by Treasure in the Arctic. Treasure in the Arctic, Dimension of Ghosts and We’re Out! The only ones I’m not interested in at all are Business Pauline & Robo BFF. Treasure in the Arctic or The Dimension of the Ghosts, but really, I’d love to read any! We are out and business pauline!!! I love your work! WE’RE OUT please, or any of the others. BUSINESS PAULINE! Or we’re out. Or tantrum. or puppy school. But honestly those are just secondary things I’d be happy to read. First and foremost: BUSINESS PAULINE. Business Pauline or Dimension of the Ghosts! I also have to vote for Treasure in the Arctic!! We’re Out!, definitely! I’d also like to see Business Pauline and the Fortune Fax Machine and Puppy School. Treasure in the artic or puppy school!!! Any other one is fine! You rock! I think I would most love to see Buisness Pauline and the Fortune Telling Fax Machine, but The Town Flyer, and We’re Out look like they would be awesome as well. We’re Out looks like it could be great!! Puppy School, We’re Out, or Weird Undersea. I can’t decide between those three! I can’t decide between We’re Out and Business Pauline! We’re out & Puppy school! We’re out, We’re Out, We’re out, and We’re out! I’d like to see “Business Pauline”, “Puppy School”, “Tantrum”, and “We’re Out”. Puppy school and Business Pauline! We’re Out, Puppy School, and Robo BFF! They all look awesome, though! Business Pauline and the Fortune Fax Machine! We’re Out! Followed by Paper Patisserie or Puppy School. DANG. I was going to vote for The Dimension of the Ghosts, but now my vote goes to We’re Out! You are awesome for setting this up. My choices (in order) are We’re out and then Arctic or Weird Sea. We’re Out or Paper Patisserie please! We’re Out, of course. Like the look of Robo BFF, too! Puppy School or We’re Out! 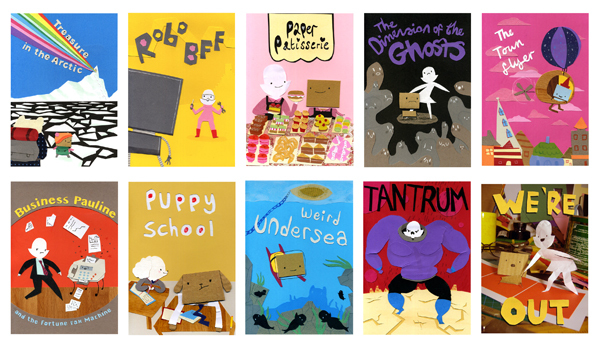 Paper Patisserie or Robo BFF are my winners. Weird Undersea or Dimension of Ghosts. My vote’s for We’re Out, and Weird Undersea. Paper Patisserie also looks awesome. My votes go to: Treasure in the Arctic; Paper Patisserie; and of course, We’re Out. Second choice is Paper Patisserie. We’re Out and Dimension of Ghosts indefinitely! We’re Out or Puppy School! Puppy School, and We’re Out! My top two are The Puppy School and We’re out, respectively. Coming in for a close third is ALL OF THEM. omfg We’re Out would be the perfect story, honestly. The Dimension of the Ghosts is my preference. I like Treasure, Patisserie and We’re Out, in no particular order. I’d like to see Treasure in the Arctic or Weird Undersea. Everything looks awesome, though — I can’t wait to see what strips 2013 brings us! Treasure in the Arctic or Weird undersea. I like adventures. If multiple votes become fractional, then just Robo-B.F.F.. If they all get 1 point, Robo-B.F.F., Business Pauline, and Treasure In The Arctic. Thanks for a spectacular 2012, in any case. I want to vote for We’re Out please! Puppy School and We’re Out! Dimension of the Ghosts or We’re Out please! 1: “We’re out” – this would be a different kind of challenge, but the teaser art looks fabulous! “MY CARDBOARD LIFE” has been one of my favorite webcomic discoveries this year; looking forward to more to come! Puppy School, or We’re Out please! Keep up the amazing work. You inspire me to be creative. I’d like to read either Treasure in the Arctic, Paper Patisserie or We’re Out! Paper Patisserie & We’re Out! But honestly, any of them would be great. Followed by Treasure in the Arctic. Although Business Pauline, Robo BFF, and Treasure in the Arctic also look good. We’re out, Puppy School, or Treasure in the Arctic! I love them all so much! As a baker, I love Paper Patisserie. I love ghost stories, so Dimension of Ghosts sounds so fun. And PUPPY SCHOOL would be so cute! I vote for Wierd Undersea and Treasure in the Arctic! I’m a sucker for explorer-type strips, plus I think they’d both look gorgeous! I’d like to vote for We’re Out and Paper patisserie. I bet I’d love the story no matter what you make, I can’t wait till we get to see one of these! Business Pauline and Puppy School. I also like Treasure in the Arctic becaue rainbows. So I guess it’s the third one. Weird Undersea looks amazing! How come there are not more votes for that one?! And Treasure in the Arctic! Thank you for all the awesome story choices! They all look super sweet! I’d LOVE to see Business Pauline, Weird Undersea and We’re Out are a close second. I think We’re Out would be quite an interesting adventure. I’m think I’m going to go for Paper Patisserie and Town Flyer, with Puppy School as a runner up. I really like both Paper Patisserie and We’re Out!!! We’re out Would love to see how the react in our world! I’m sure which ever one gets picked will be great either way! Definitely Treasure in the Artic or Weird Sea! We havent seen any underwater creatures! You are sure to be creative! Also, the Artix one seems very mysterious like Indiana Jones!!!! Treasure in the Arctic! OR Weird Undersea! I’m loving RoboBFF, but they all look fun. Paper patisserie or dimension of the ghosts! Weird Undersea. That would look so cool, though I think you could do wonders with The Dimension of the Ghosts! We’re Out. Please, God, We’re Out. I like Dimension of Ghosts, Weird Undersea, and Paper patisserie. These are always great! Thanks! We’re Out and Business Pauline! love your stuff!! And I’d love to see the ‘Weird Undersea’ story! Allo! I’d like to see We’re Out or Puppy School, please! We’re Out, Puppy School and Business Pauline? The Dimension of the Ghosts, please! Haha its crazy-awesome how many people are raving about it! You surly have a whole new revolution of comics with your characters!! SO ADORABLE! !